Last year, the Bubs and I toured the town for the Best Sno Cone EVER. And we found it next to a tepee. No, really, it’s the TP Church, even shaped like one. And across the street…the Best Sno Cones EVER. This year, we ventured into the Sonic Drive-In for a much-needed chili dog. Horrible nutrient wise and certainly not thigh-slimming; super, though, for the jonesing-for-crap DNA I possess. And in the stall next to us sat an enormous, lit-for-best-view-from-space neon sign advertising suggestions of the variety of Sonic Drive-In drinks that can be made by carbonating sugars, syrups, candy pieces, and corn syrup. Well. That’s a CHALLENGE if ever I’ve seen one, right? I mean, c’mon, who can resist the glow-in-the-dark coloring of all things un-naturally purple? Like a moth toward a flame, baby. the Bubs Edition, and the Mama Format. And the worst part…er, I mean, the BEST part…is that the drinks on the list only need to look INTERESTING, not DRINKABLE. AND. We both have to try all the drinks! Last night was the First Day of the Voyage into Unpalatable Beverages, but since it’s one thousand degrees outside and I don’t stop whining about the heat until Halloween, anything cool and/or icy is a PLUS to moi. On tap for me: Tea, BUT. I already deviated slightly from my own list, because I had initially written “Raspberry Iced Tea,” and my craaaaaaazy rogue ways went with PEACH. I know! I’m a warrior! WHAAAAAT?? Peach tea!? Insanity. 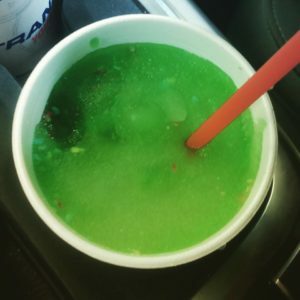 Bubs’ first selection: Green Apple Slush with Jolly Rancher Pieces. After I told him, “That cannot be a thing,” he indeed successfully ordered it. Since, per the agreement, we BOTH must try BOTH drinks, and because I’m a Mom, I went first. I sipped fully, with caution. Bubs stared while I tried to get the feeling back in my tongue and willed my eyes to re-seat themselves in my sockets — they went internal, like, touched my brain; that’s how far back into my head that they were sucked by the pucker of the green apple tang cruelty that lay festering in the Sonic cup. And while I was trying to regain a normal breathing pattern, my Bubs sipped my innocuous iced tea — with the wacky zing of Peach that only a Mom can bring — and he acted like I’d fed him strychnine. I’d love to see the video from the Sonic security cameras, the one showing the Bubs and I, both suffocating from icy beverages that we hurriedly exchanged, thereby sucking upon our own beverage choices as though the straws held a rich oxygen mixture able to reanimate life forms and not make them oh-so-hate this new 10 Day drink challenge. But worse than trying to tease my tongue into unfurling — “no, no, I won’t let the bitter foul taste get you again” — is the drive home, when the drinks are half finished, my tea is delightful, but alas, the Bubs has chosen a slush, which had all the liquid sucked out of the ice, and is thus not slushy, which means he’s dry-sucking ice bits and candy pieces up a straw, across air bubbles hitting the sides of the plastic straw and resembling the sound of my grandmother’s coffee percolator, the one that woke me at unearthly hours as a child and made me deeply resent all coffee forms until much later in life, when I could buy the coffee premade and thus eschew all knowledge of coffee brewing sounds. I digressed a moment, but still, I insist that the soundtrack of Bubs sucking air and ice particles — then pulling the straw up and down through the plastic lid, with that awful donkey-in-the-morning braying sound over and over; really, it’s like nails on a chalkboard, you know the sound — then sloshing around the frozen mess with his straw like that will liquefy things quicker, then continuing with his musical number, like Orcas coming up for air. That’s what it sounded like when he retried to drink the no-more-liquefied air and chunks. It was a musical number that rattled across my peach-tea ridden nerves all the way home. Cranberry Frozen Limeades — because Large was cheaper than Small in the morning (?) — a concoction we both agreed looked enticing, and thus we tried them on the same day. The two giant cups lasted all day long, with our finally tossing the nearly empty cups into the trashcan at 5:05 this evening. We were wired for sound all day, buzzing around like we were on fire for 8 hours waiting for the sugar effect to dull. 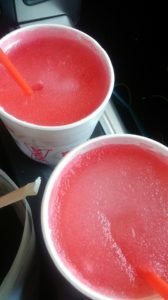 This entry was posted in Prairie Life and tagged #worthwritingoutloud, drinks, Sonic, summer by michelleferg. Bookmark the permalink.